3 May 1902, A TRANSFER OF LICENCE REFUSED. 18 Jan 1908, SATURDAY, FEBRUARY 22. At a quarter past three O'Clock. At WHITE's HOTEL BEACONSFIELD. MORTGAGEE's SALE of FARM LANDS at BEACONSFIELD. W S. KEAST and Co. and G. W. MARTIN (in conjunction) have received instructions from the mortgagees to SELL by PUBLIC AUCTION, All that piece of land, containing 319 acres 3 roods 37 perches, or thereabouts, being Crown Allotment 71A of section D, parish of Gembrook, county of Mornington. This land is situated within 7 miles of either Beaconsfield or Berwick R.S., and 35 miles Melbourne. It is undulating land, varying from dark to good grey loam, pliable, and easily worked and a good sole of native grass runs through the property, about 12 acres being sown down in English grasses, and the timber has all been rung and dead, except for shelter. Fifty acres are cleared and ready for the plough, the fencing, is still substantial, and the property has a frontage to the Cardinia Creek, which is a permanently flowing stream. The buildings consist of a comfortable W. B. cottage, stables, loft, and buggy-shed, all necessary outbuildings. The property is suitable for mixed farming, fruit growing, or a country residence. [S2] Registry of Births Deaths and Marriages Federation Index Victoria 1889-1901 "#M1572." [S2] Registry of Births Deaths and Marriages Federation Index Victoria 1889-1901 "#M7069." [S185] Property Titles. ; PROV (Public Records Office Victoria), C/T 1317-222 - Isabella Sykes to Mary Ellen Cregan of the Pine Grove Hotel Upper Beaconsfield Licensed Victualler - C/T 2841-137. A caveat had been lodged a day before Baxter granted the mortgage - it lapsed on 3 Oct 1907 when the property was sold to James Young. [S185] Property Titles. ; PROV (Public Records Office Victoria), C/T 2563-439 - John Hayes to Thomas Henry Cregan of Upper Beaconsfield Dairy Farmer and Mary Ellen Cregan of the same place his wife. [S185] Property Titles. ; PROV (Public Records Office Victoria), C/T 2563-439 - Thomas Henry Cregan and Mary Ellen Cregan obtained a mortgage from John Hayes. Mortgage No 253975. [S185] Property Titles. ; PROV (Public Records Office Victoria), C/T 2841-137. [S16] Newspaper - The Age The Age (Melbourne, Vic. : 1854 - 1954), Sat 3 May 1902, p11. [S11] Newspaper - Argus 18 Jan 1908, p2. [S80] Ancestry - Family Tree, Elder/Ferguson Family Tree - Owner: cpalmer26. [S14] Newspaper - Albury Banner and Wodonga Express (NSW), 11 Nov 1898, p29. [S83] Online index to the UK census "Class: HO107; Piece: 1758; Folio: 386; Page: 12; GSU roll: 193648." [S2] Registry of Births Deaths and Marriages Federation Index Victoria 1889-1901 "#B18793." Male, Gibbs, William, Gun shot wound, Berwick, 1908/350, 18 Apr 1908,. 3-246-B Gibbs William M 16 19/04/1908 436. [S11] Newspaper - Argus 21 Apr 1908 p8. [S12] Newspaper - South Bourke and Mornington Journal 22 Apr 1908, p2. 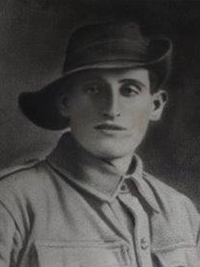 Stephen Leslie Gibbs enlisted on 2 Oct 1914, when he was 19 years old. His unit, the 16th Battalion, 1st Reinforcement embarked from Melbourne on 22 Dec 1914 on HMAT A35 Berrima. SERN 1411. Stephen GIBBS was wounded at Gallipoli, and had several illnesses since, including trench feet in France. He returned to Australia on 5 Apr 1918, and was invalided in Sep 1918. 22 Jun 1918, WELCOME HOME AT WALPEUP. 8 Jul 1918, OFFICER WELCOMED HOME. Members of 23rd Battalion Association assembled in huge numbers at Sargents Cafe on Saturday night to welcome home Lieutenant-Colonel G H Knox, CMG, who was the commanding officer of the battalion both at Gallipoli and in France, and was invalided home last month. In proposing the toast of "Our Guest," the chairman (Major Baird, MLA ), said that the manly qualities and genial nature of Lieutenant-Colonel Knox had endeared him to every member of the battalion. Lieutenant H C G Macindoe, in a brief speech, said that in order to remove a misapprehension it should be explained that the association had been formed for the purpose of bringing together and organising returned members so that they would be in a position to obtain direct representation on the returned Soldiers' Association. He urged every member to join that body. After responding to the toast, Lieutenant Colonel Knox proposed "Sister Battalions," and other toasts honored were "Fallen Comrades," proposed by Colonel Chaplain Macrae Stewart, and "The 6th Brigade Comforts Depot," proposed by Major R F Maberly Smith, M C.
[S2] Registry of Births Deaths and Marriages Federation Index Victoria 1889-1901 "#B8315." [S35] Probate Records, PROV (Public Records Office Victoria), VPRS 28/P4, unit 4325; VPRS 7591/P3, unit 736. [S14] Newspaper - Barrier Miner (Broken Hill, NSW), 30 Sep 1915, p2. also published in Ouyen Mail (Vic), 12 Jun 1918, p1. [S11] Newspaper - Argus 8 July 1918, p6. [S80] Ancestry - Family Tree, Pedler Family Tree - Owner: 51mareesp. 17 Jun 1901, NEW DOCTORS OF LAW. UNIVERSITY HONORS. London, June 14. 25 Jan 1912, OBITUARY. PROFESSOR MARTIN IRVING. LONDON, January 24. The death occurred yesterday of Professor Martin Howy Irving. He was 81 years old. From 1871 to 1876 Professor Irving was headmaster of Wesley College, Melbourne, and subsequently of the Hawthorne Grammar School. IRVING, MARTIN HOWY (1831-1912), professor, headmaster and civil servant, was born on 21 February 1831 at St Pancras, London, son of Edward Irving (1792-1834) and his wife Isabella, née Martin. His father was the famous Scots preacher who was declared a heretic by the Church of Scotland and founded the Irvingite or Catholic Apostolic Church; Thomas Carlyle called him 'the freest, brotherliest, bravest human soul mine ever came in contact with'. From King's College School, London, Martin won a Balliol College scholarship and matriculated in November 1848. He was the university junior mathematics scholar for 1850 and obtained first-class honours in classics and second-class in mathematics (B.A., 1853; M.A., 1856). He had signed the Thirty-nine Articles of the Church of England at matriculation, holding that subscription did not preclude his special witness as a member of the Catholic Apostolic Church, but he would not take holy orders as required for most Oxford fellowships. In 1854 he became classics master of the non-denominational City of London School. In November 1855 Irving was chosen to succeed the first professor of 'Greek and Latin Classics with Ancient History' at the University of Melbourne. He arrived at Melbourne in 1856 and began teaching in July. Early next year his title was changed to professor of classical and comparative philology and logic. Although students were few, he delivered eighteen lectures a week in Greek, Latin, logic and English. In the final honours school he introduced rhetoric and aesthetics applied to English literature. In 1858 he successfully urged the examination for degree of students who were unable to attend lectures, but the council rejected his schemes for an associate in arts diploma for non-members of the university in 1857 and for the abolition of compulsory Greek for arts degrees in 1858. As an examiner of matriculation English, Greek, Latin, French and German he became an ally of schoolmasters advocating curriculum change. In January 1871, with the offer of a higher salary and better accommodation for his large family, Irving became non-resident headmaster in charge of secular studies at Wesley College, Melbourne. A resident clerical president was responsible for religious education and the care of boarders. Under Irving the school achieved great success at public examinations. Numbers grew rapidly to a peak in 1873, not surpassed at Wesley until 1900. He deplored the low level of matriculation requirements and built a sixth form of boys staying at school after matriculation. He placed an Arnoldian stress on character formation and trust in the sixth form as 'a democracy of gentlemen'. In December 1875 he bought the Hawthorn Grammar School. Numbers doubled in his first year, new buildings followed and the school became one of the biggest in the colony. He continued to insist on English, arithmetic and Latin as studies most apt to develop 'the faculties of imagination and correct reasoning', but the school also offered Greek, mathematics, history, geography, chemistry and book-keeping. Games were stressed as 'an indication of a school's vigour'. As a councillor in 1875-1900 and vice-chancellor from May 1887 to May 1889 Irving was an ardent university reformer. In the senate and council of the university he led a 'caucus', composed mainly of schoolmasters, who constantly challenged the administration of the chancellor, Sir Redmond Barry. In Barry's absence overseas, Irving attempted in vain to unseat the chancellor and not until Barry died in 1880 were new chairs instituted in natural philosophy, engineering, pathology, chemistry and English, French and German languages, while the addition at matriculation of natural science subjects and an honours standard marked the culmination of ten years' agitation. The 'caucus' caused Chancellor (Sir) William Stawell's resignation in 1882, but growing opposition to the influence of outside educational interests in the university delayed the appointment of a successor. Irving, a reluctant nominee, failed by one vote for the chancellorship in May 1887 when Dr Anthony Brownless was appointed in conservative reaction to the unstable years of factional strife. Irving's equable temperament, administrative capacity, vitality and manifest probity inspired confidence. In 1872 he was offered the post of permanent head of the Victorian Department of Education. He was chairman of the Victorian board of the Australian Mutual Provident Society in 1878-84. Intended for the post of full-time, salaried vice-chancellor he was proposed by the University of Melbourne Council in 1888 but rejected by the professoriate. In February 1884 he was appointed one of the three foundation commissioners of the Public Service Board of Victoria, and left Hawthorn College in charge of his son, Edward. When the board was disbanded in 1893 Irving was granted a pension. He left Australia in 1900 and apart from a brief visit to Melbourne in 1906 lived in England. A devoted adherent of the Catholic Apostolic Church he died on 23 January 1912 among his fellow believers at Albury, Surrey. [S1] Registry of Births Deaths and Marriages Pioneer Index Victoria 1836-1888 "#D4731 age 54 [par Henry Pringle BRUYERES & Anne Judith Laurie FEELOR]." [S14] Newspaper - Brisbane Courier (QLD), 7 Jul 1882, p1. [S14] Newspaper - The Advertiser (Adelaide): 17 Jun 1901 p5. [S14] Newspaper - The Advertiser (Adelaide): 25 Jan 1912 p9. [S14] Newspaper - The West Australian (Perth): 25 Jan 1912 p7. Print Publication Details: G. C. Fendley, 'Irving, Martin Howy (1831 - 1912)', Australian Dictionary of Biography, Volume 4, Melbourne University Press, 1972, pp 462-464. [S80] Ancestry - Family Tree, Cris - My Evergrowing Tree - Owner: cris782. [S11] Newspaper - Argus 17 Jun 1881 p1.